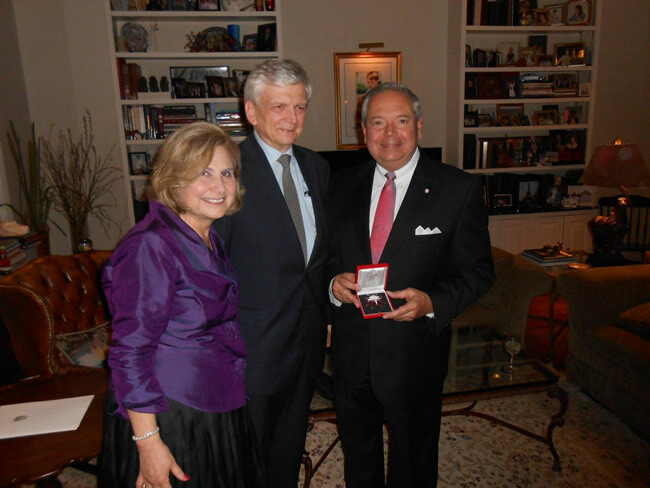 On Thursday, December 6, 2012, Austrian Ambassador to the United States Dr. Hans Peter Manz presented Philipp Lorio III, Austrian Honorary Consul General for Louisiana and Mississippi, with Austria's Grand Decoration of Honour in New Orleans. After finishing his law degree, Philipp Lorio III started to work as an attorney at the law firm „Deutsch-Kerrigan and Stiles“ and was made partner in 1982. In this function, Mr. Lorio headed the Civil Litigation Departmant and served as an Assistant City Attorney in New Orleans from 1974 until 1978. He is a member of various prestigious organizations including the American Bar association, the Defense Research Institute, the American Trial Lawyers Association, and the Louisiana State Bar Association. He was appointed as Austrian Honorary Consul for Louisiana and Mississippi in 1991 and he is one of the longest serving members of the Austrian Consular Corps.